POS software update rolling out | A blog about smart POS software for independent small businesses. We are well into the roll our of our latest POS software update for small business retailers. Following a comprehensive beta release cycle, the update was cleared a week ago for release. We started emailing customers, in batches, releasing access to the update. This batched approach to the release helps us manage the help desk load. Giving our customers control over when they install an update is important to us and appreciated by our customers. We are thrilled to be delivering a comprehensive update that is packed with enhancements suggested and voted on by our customers. We are grateful for the engagement of our customers in achieving this. What a terrific bounce for the last quarter of 2016. We have been helping Xero skilled accountants and small business retailers using Xero connect as part of our integrated Xero POS software engagement. Through a free listing on our website and in our weekly email communication to our customers, we are happy to list accountants with terrific Xero skills. This is how the Xero community works – people passionate about this wonderful accounting software supporting each other to bring more to the community. We use Xero ourselves in our own businesses. We love it. Help us help small business retailers find good accountants. We are grateful to serve 3,500+ with our POS software for: gift shops, jewellers, toy shops, fishing/outdoors shops, pet shops, garden centres/nurseries, bike shops, produce stores, firearms shops and newsagents. We are a Xero partner, having integrated our POS software with Xero. We also use Xero for retail shops we own and run. We operate these businesses so we can walk in the shoes of our customers. We want to help small business retailers find Xero skilled accountants. We have a page on our website where we list this. We also include the list in our weekly customer email. Click here to see this week’s email. To be included on our list, please email me your details. There is no cost, no obligation. Our sole objective here is to help small business retailers find Xero skilled accountants. We get to see many different retail stores in our work serving small business retailers. To us, the best looking stores are those that are not cluttered, that do not have too many posters, notices and displays competing for eyeball time. Stand at the entrance to the business and note how many posters, signs, offers and displays are vying for attention? Next, try and cut the number by half. Often we find in retail that less can be more. Fewer posters, signs and displays can result in those who you have generating a better return for the business. While this advice has nothing to do with small business POS software, we are fortunate to be able to build other skills as we work with our customers. We are also grateful to have our own retail shops where we can play with these ideas for ourselves. Here we are 100 days from the last federal election and not much has changed for small business. The words from the campaign about the importance of small business to the Australian economy appear to have been forgotten as politicians prefer to fight each other over issues of little relevance to everyday Australians and small business owners. Take the issue of Australian banks. Small business owners are treated appallingly by by the big four banks. There are countless stories of shocking service and unfair practices yet the government refuses to establish the mechanism most Australians want for these issues to be considered – a Royal Commission. Take the issue of red tape. We recently wrote to federal and state ministers responsible for an area related to one o our specialty software packages. In our letter we noted each state and territory has different requirements for what should be a national matter. We received responses from all the minister offices and not one letter progresses the matter – leaving small business owners navigating arcane and time –consuming red tape for the sake of red tape. What we want is politicians who are true to their word, politicians who deliver opportunities for improved efficiency to small business, politicians who demonstrate through legislation that they actually believe small businesses are the backbone of Australia. Right now, it seems to this small business that politicians are all talk and no action. We have a new position to fill on our POS software help desk and have been running a campaign at Seek that from the outsets seeks to attract people with an attention to detail and who are proactive. We have done this by embedding in the ad two requirements, the responses to which have helped us easily separate the candidates. Interviews are well under way with the final round expected Monday. 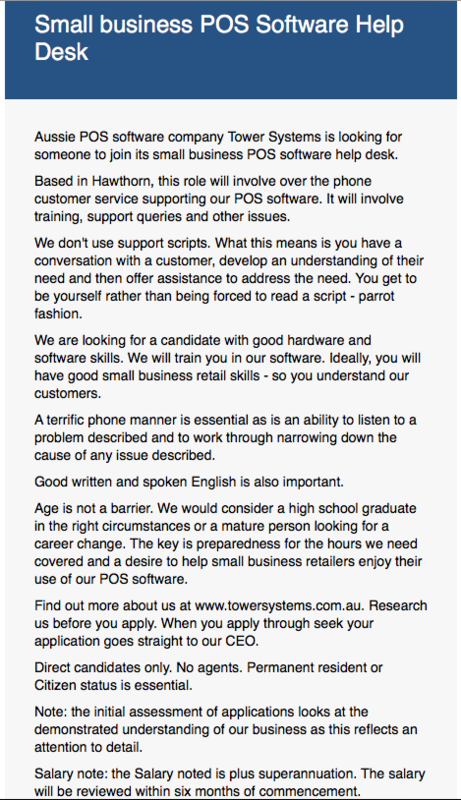 We are excited for the opportunity to expand the experiences within our help desk team. One of the best ways we help small business retailers using our POS software is by meeting with suppliers to guide their data path so that it best serves the needs of their core customers, small business retailers. One of the best ways to guide suppliers is at the source. This is why we invest in and attend trade shows around the world. At the Hong Kong Gift Fair this week we had terrific conversations with suppliers from Australia and their source suppliers. Some of these discussions centred around the quality of business data, to help ensure that our retailers benefit from quality data from the outset. This work includes ensuring barcodes meet respected international standards. From that flows the discussion about invoice files and that they meet international EDI standards. Too often software companies do not engage in these topics and the result is poor business data at retail and this leads to poor outcomes for retailers. Data is king and here at Tower Systems we work with retailers to help them provide access to quality data at all points in their businesses. Shopify is one of the easiest ways to setup and run an ecommerce store. We think it provides you with the ideal place to create you first website and gain experience in the world of ecommerce. You have complete control over the look and feel of your online store and can instant access fantastic look themes to reflect the personality of your business. For more information visit www.shopify.com.au. What is the Retailer to Shopify Link? The Retailer to Shopify Link uses the Tower Advantage Link platform to allow retailers using the Tower Systems POS software – Retailer – to connect directly to your Shopify store. The Tower Advantage Link platform is a subscription-based service that acts as an intermediary between Retailer and the Shopify API. The link works by using the TALink platform platform to connect to the shopify API and synchronise your data. Retailer is your master stock database. You flag what stock items you want to appear on your shopify store. Descriptions and extended descriptions are added as your titles and descriptions in Shopify. Newly flagged products are automatically added and if you edit items in Retailer you have field level control over how these are handled in Shopify. Your Retailer Departments and Categories become collections in Shopify. You can have a chose of either Department level collections or category level, but not both. If you choose to synchronise either a department or category, your existing structure will be mirrored and managed in Shopify automatically. If, however, you decide not link your Department and Categories in Shopify, you can allocate collections manually to products once they are added. Shopify does not have a mechanism to manage classifications. You have control over your webstore pricing from within the Retailer Stock Screen. Bulk updates of the webstore prices can be performed in Stock Manager. Once new prices are set, your web store is updated automatically. Quantity on hand is also managed automatically, when your sell or arrive an item into stock these adjustments are sent directly to Shopify. If the quantity on hand of an items drops to 0, the item is marked as out of stock in Shopify. The images you set against stock items in Retailer are automatically uploaded to your website. If images change, then old one is removed and the new one is added. You can upload as many images as you like per stock item. Customers that purchase off your webstore are added as customers in your Retailer database, allowing you to track what they buy and market to them if you desire. Existing customers with an email address will also be added to your web store to facilitate easy sales if you choose. Sales are downloaded on a periodic basis and imported into Retailer. They are imported into our Customer Invoice Maintenance facility allowing you to place orders and print invoices if needed. Once sales are imported it reduces your quantity on hand so you maintain accurate stock control. Sales can be allocated to a specific location or merged to you main sales data, giving you excellent control over how you report on your webstore sales. I don’t have a website but want one. Can Tower help? Yes! We can build and customize a basic Shopify website for you if you like. Please talk to your local sales representative for more information. We love Shopify. It is a terrific starting point for any retailer looking to get started online. We are thrilled to be connected with Shopify. Tower Systems is proud to offer the only Australian developed and supported software specifically for jewellers. We are a software company first. What this means is we are not consultants with a prime focus on earning consulting fees. We make good software you can use without having to pay someone to analyse this for you. Since we make the jeweller software ourselves we have the very best control over the software. This means we are able to deliver more user-suggested changes more quickly than software that is developed overseas or from a company owned by overseas interests with more of a focus on overseas needs. Australian software for Australian based jewellers matters as it serves local needs. And retail is changing locally quickly. Easy handing of special orders. An elegant solution for managing the manufacturing process. A comprehensive repairs management solution. The easy ability to fine tune marketing to reach customers when you want and need to deliver the service level you hope for. Easy website integration. WHAT IS UNIQUE ABOUT TOWER SYSTEMS? Our software evolves based on jeweller needs. We have a transparent approach to learning and serving needs beyond what we do today. The proprietary TAGS facility in or software is a genuine technical point of difference jewellers have told us they love. We are grateful for their feedback. We serve jewellers, not groups. Jewellers are our customers. While we happily enhance the software to serve marketing and buying group needs, the needs of individual jewellers come first as in our experience they have the very best ideas. Lay-by. Our Lay-by facilities have been developed in close consultation with jewellers, making them unique and comprehensive. You have access to extraordinary customisation through settings, enabling you to represent your business how you want. Embedded in our software are facilities for tracking how the software is used. This enables us to help you reduce employee theft. Retail focussed. A challenge of retail is to uncover opportunities early. Smart reports in the Tower software unlock information about your business that too often is overlooked. Jewellers are welcome to check us out. We are proud to serve hundreds of jewellers already. Show don’t tell. This is the best way to sell in retail. Retailers who have staff on hand to show customers how to use a product can expect better sales results from showing rather than telling. This is why retailers in homewares stores set tables for seasons and dinners. It is why toy shows have toys out for kids to play with. It is why garden centre create beautiful gardens for people to aspire too. Here at Tower Systems we believe in show don’t tell too. We host weekly online training workshops that are live, interactive and engaging. Our topics are small business compatible. We focus on business outcomes that small business retailers will love based on the feedback they have given us. In the coming weeks we are running a series of workshops that will deliver excellent outcomes to retailers by offering practical help and support in ways they can use the software to differentiate their businesses. This is where we are genuinely different. We are consistent in running these free workshops. In the workshops we show how to do something rather than telling about it. We let our customers guide the training. Plus we provide after training follow-up and feedback opportunities. We are grateful to customer support that encourages our business building training for without their support we would have o attendees and that would see us stop running the sessions. That we continue to deliver these opportunities years after we announced them is all down to our wonderful customers. The annual stock take is not necessary in small business retail. Thanks to smart custom stock take facilities and tight inventory management made easy, POS software company Tower Systems makes it easy for small business retailers to change their approach to stock take forever. Save time by eliminating the annual stock take. Save money by eliminating the annual stock take. Improve inventory accurate by eliminating the annual stock take. Cut shopper theft by eliminating the annual stock take. Cut employee theft by eliminating the annual stock take. Tower Systems has been actively engaged with retailers, accountants and the tax office on this project and the result is a beautiful approach to stock take in small business retail the improves the shopper experience. It also provides valuable small time frame tasks for employees to do on the shop floor that help the business improve and employees know more. Thanks to use of proprietary tags and other smart tools, the custom stock take facilities in the Tower Systems software are revolutionary, in a good way and in a time saving way. Our advice for small business retailers today is to eliminate the annual stock take. replace it with the more efficient and business friendly approach. The Tower Systems software continues to offer full stock take facilities as well as other stock take options. However, the custom stock take facility is the most valuable in terms of category management, supplier management and time management in any retail business. Retailers can choose how and when to stock take. The tags facility in the Tower Systems software takes the custom stock take options to a new height. Tags are a genuine differentiator. Where is your POS software company today? It is almost 9am today, Saturday October 22, 2016, and our help desk based out of our head office has been busy answering questions for customers and providing training. Our leadership team, too, has taken calls already. The majority of calls on the weekend are not about problems with the POS software. Some relate to retail supplier files, others relate to other software and some calls are for business advice. As we are accessible we take the calls and help as much as possible. A core tenet of good customer service is being accessible to your customers when they need you. We are proud to be available on days like today. Where is our POS software company today? Australian POS software company Tower Systems has launched a cloud-based appointment facility. Available as stand-alone as well as integrated with the Tower POS software, the new appointment facility enables people to make an appointment with a business from anywhere and at any time. developed in close consultation with pet groomers, bike repairs experts, jewellers and others who make appointments as part of their everyday business services, this new facility has been built from the ground up to serve a vital need in small businesses. Careful testing and consultation has been the key to creating a solution for the businesses and their customers that is accessible from anywhere and at any time. This is user-centred software at its best and Tower Systems is grateful to its customers for helping to make it a reality. Easy appointment making as well as changes – from any device, anywhere. Text message and/or email notification. This is a must for seamless and easy customer engagement. Send reminders of appointments. The business can choose how this is done based on their needs and the needs of their customers. Schedule staff, rooms and equipment based on the type of appointment being made and staff and resource availability. This is key to efficient resource management in the business. Australian developed and supported. True blue. Data located on a secure server in a purpose built data warehouse facility. Low monthly access cost. Paid 30 days in advance. Easily cancellable. Tower Systems POS software integrated to make processing payments easy. Business management back end to see the schedule of appointments by staff member and overall and to efficiently manage resources. Developed initially for pet groomers, this new appointment facility has been designed to serve a variety of needs including managing appointments for product repairs, professional services and other businesses. Each business has its own public-facing landing page that can be found through search engines. There is also a website plug-in to enable appointments to be seamlessly made form your website. Priced at $1 a day, the Tower Systems appointment facility is low cost. 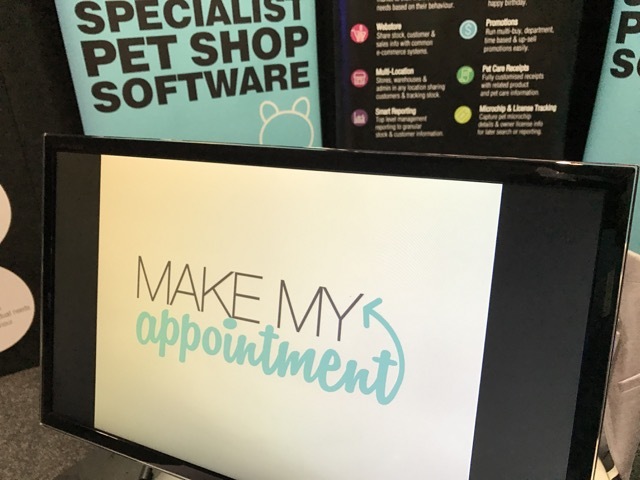 We are having a terrific time at the Pet Expo in Melbourne this week where our Pet Shop software is on who at the entrance / exit to the show. The professionalism of our stand reflects the Tower difference. As well as a beautiful design aesthetic, the stand reflects the broad functionality of our software, clear communication, good organisation and easy access. In addition to our software we are showing off our new cloud based appointment facility that brings a beautiful appointment solution to groomers and other service providers in the pet space. This facility works on any device, anywhere. While the trade show has half a day to go, the response already has been terrific. We are grateful for the support we have received so far. Trade shows like this provide an excellent opportunity for easy comparison with competitors. We love such comparisons as too often competitors don’t want this to be easy. Small business retail is tough at the best of times. On our POS software help desk we get to talk with many retailers in a range of situations. It is calls when a business is in tough times that can be challenging. Through our work with many different retailers we have developed an approach to help retailers in tough times confront these challenges. Here are our thoughts on this, ways we help small business retailers find optimism amid a fog of challenge. Finding optimism is important as it is through this view that you are more likely to make better business decisions. 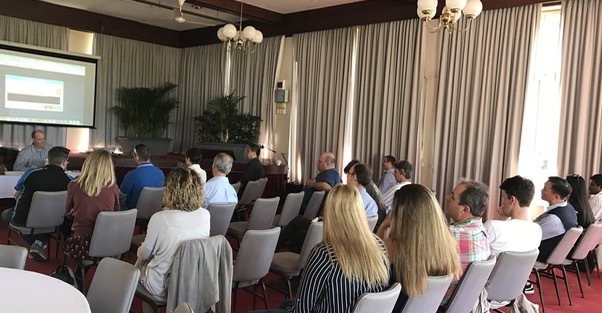 We are grateful for the opportunity to meet with many small business retailers around Australia over the last two weeks for our POS software e-commerce workshops. The support for the sessions has been terrific as has been the discussion. We demonstrated how our POS software links seamlessly to Shopify and Magento as well as other platforms. We also showed live how to create a Shopify site – empowering small business retailers to have more control over their online presence. Providing a stable in-store platform from which to populate a website, the Tower Systems software can play a key role in helping small retailers get online in a cost effective way. This enhances the value and relevance of their POS software investment. By doing all of this in-house from Tower we are not bouncing our customers to an external business that may not understand our customers as such as we do. The free workshops are part of our commitment to delivering continuous learning opportunities to our small business retail partners. The photo was taken toward the end of our Sydney session last week. This video is another in the series of educational videos from Tower Systems to help small business retailers be more informed in the choices they make. Tower Systems is thrilled to welcome more Complete Angler fishing and outdoors stores to those already using our POS software for fishing retailers. Offering a seamless Xero integrated POS solution refined for the needs of growing fishing and outdoors businesses, the Tower Systems specialty retail software is an ideal solution for a Compleat Angler. Sell fishing licences for Victoria and New South Wales – from within the software. Sell products as hampers / packs / bundles. Sell by weight – like bait. Offer traffic-driving shopper loyalty – $$$ off the next purchase based on rules you set. Successful loyalty offer for independent retailers. Offer the more traditional points-based shopper loyalty. Import electronic invoices and stock files from suppliers. Reorder based on accurate data – reducing the cost of dead stock. Handle BOGO: handling Buy One get One Free offers. Offer MultiBuy – like a coffee card, free product over time. Save time with the Xero accounting interface – cut bookkeeping costs. Link to Magento and Shopify – connect to your website. Save time & cut mistakes with EFTPOS integration. Save time on stock takes. Print professional receipts with your logo. Age check for items with a minimum age requirement. Use up-sell prompts for staff. 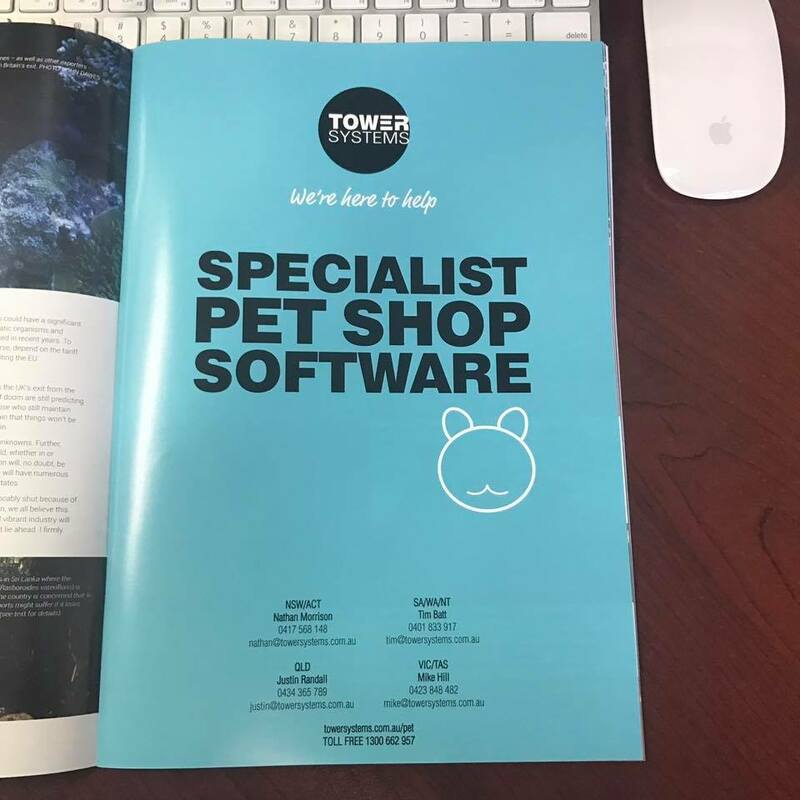 Our marketing of our Pet shop software is in full swing with the Pet Expo in Melbourne this week. The respected industry journal has a full age ad from us raising brand awareness for our software ahead of the expo. We are grateful for the opportunity to support the industry with your ad spend. The latest release of the Tower Systems POS software includes more than 130 changes with the majority of these suggested by users looking to evolve the software they use as they evolve their own businesses. Our democratic and transparent process for considering software enhancements is paying off for our customers and for us as we work together to ensure our software evolves with customer businesses. This new feature brings our Layby Receipts into line with the recently revamped Sale and Invoice Receipts. The new format contains clearer and more discernible information as well as the ability to customize. We have also made sure the new receipts meet any TRS requirements. As part of this work we have also added Layby Notes which will allow users to add notes on a per item basis for use in things such as storage locations. This new feature allows users to prompt for receipt printing for sales where EFTPOS was used as the payment type. This is an optional setting and is available for those using our integrated EFTPOS platform with Tyro, DPS, PC EFTPOS etc. This new feature gives users a tight link between Retailer and their Shopify based Webstore. Including integration of Stock, Customers, Sales and Product Images. The key feature is the time saving of not having to double entries in multiple platforms. As a result of extensive customer feedback and Software Ideas submissions we have made further improvements to the Special Customer Orders module to provide a cleaner and more coherent approach. For a detail list of the changes made to Special Customer Orders please see below. As a result of extensive customer feedback and Software Ideas submissions we have made significant improvements to these modules to provide a cleaner and more coherent and retailer friendly approach. For a detailed list of the changes made to Multi-Store Ordering please see below. Users now have the ability to show which items show in the Customer menu and the Payment menu. For example if you wanted to only show the Pay Specific Invoice and the Pay Layby options all the others can be easily hidden. This feature can be accessed by double clicking on the blue menu bar at the top on the menu screen. All Tower customers are being advised the full site of enhancements in advance of them deciding if they would like the update installed for their business. Halloween is a fun season in retail. It is an opportunity to ramp up traffic and sales leading up to Christmas. It is also an opportunity for the business to play outside its comfort zone. This is great news for any small business retailer. Run a series of Facebook posts early in the season. Through these demonstrate your engagement as unique, different. make your front window scary amazing. Have customers step into Halloween when they step into your store. Have a fancy dress competition on the weekend before. Mock yourselves in social media and elsewhere about being big kids, scary pants or more. Change how people look at your business. Run sales connected with people dressing up to access a sale price. A colouring competition for kids with a prize for the best. Have candy to give away. If you’re in a small town organise a Halloween trick or treat party for safe kid fun. Print a recipe sheet and give this away. Online you can find recipes for eyeball soup, eyeball appetisers, bloody desserts and the like. Here at Tower systems we are all about small business retail. Anything we can do to help we will do, including providing practical business management advice for retailers on seasons such as Halloween. The list we publish to retailers using our POS software showing Accountants who are Xero experts is gaining popularity with our customers and with accountants – with more joining the list. We are thrilled to share details of Accountants who are skilled in using Xero as it helps spread the use of this terrific cloud based accounting solution. The list of Xero qualified accountants is part of our POS software customer weekly communication. Tower Systems is thrilled to be offering several free online training workshops where we will demonstrate the new facilities offered in our refreshed POS software for small business retail. 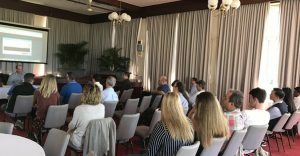 These online sessions are in addition to the live and face to face briefing sessions we have been hosting around Australia recently. Training small business retailers about software enhancements prior to releasing these is important is it helps retailers replace for change or even decide if they want the change. This and other training is available to our customers at no cost. Being a certified Xero partner, listed on their website and participating in their events positions Tower Systems with authority in this space of POS software Xero integration. We appreciate the Xero support from being a partner with them. For us, in several of our specialty retail channels, this is differentiating. It positions us differently to competitors that are not this connected with Xero and not lusted on their website. Our Xero integration is clean, neat, with many users in many different retail channels. We are also working with accountants and bookkeepers in many locations helping them serve their customers leveraging the POS software / xero integration. While we link to other accounting solutions, Xero is the winner in our view based on our own personal experience with it. 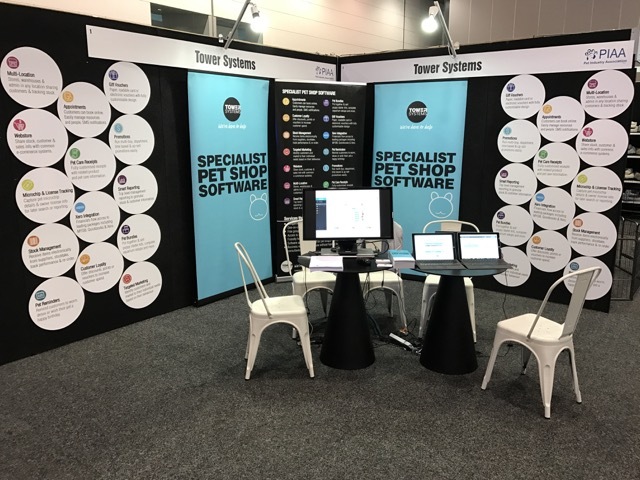 The powerful Tower Advantage Link platform allows Tower Systems’ specialist retail software to connect directly to Xero, one of Australia’s most popular and streamlined accounting services. Linking Retailer to Xero saves you precious time by completing the majority of your day-to-day accounting for you. We are experts at bringing independent retail businesses and Xero together and pride ourselves on connecting business owners with such an innovative, useful service. We are thrilled to have a new voice on our help desk. James has come to us from retail where he had years of experience using our software. When he speaks with a retailer using our software, he can speak from his own experience. This is another difference for our POS software company. We have people here on our help desk with recent retail experience using our software. This helps provide context for advice and in small business, context can be everything. Anyone can read a script in proving POS software support. It takes retail passion and knowledge to provide genuinely useful POS software support. That is our goal through the people we bring on board an the nurturing we provide them in what they do. Our Australian based POS software help desk is a valuable differentiator for us.